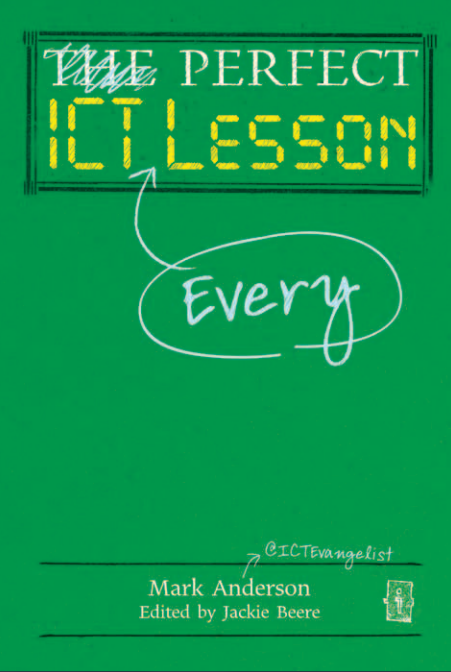 I suspect that the excitement will die down eventually but the long process that has been the creation of my book ‘The Perfect ICT Every Lesson’ has reached its ultimate conclusion – it’s in print and I have a copy sat next to me as I write this post. I started writing it about 12 months ago and the first few chapters flew out. I remember going to Pedagoo in Newcastle and being so excited to say I was going to be writing a book in the already hugely successful ‘Perfect’ series. I remember clearly the comments and support from visitors to the event such as Kenny Pieper (@kennypieper) and Laura Sutherland (@laura_suths) and I kept on plugging away. Early on in the book I had lots of help and support from colleagues such as Jim Smith, David Didau and friends such as Helene Galdin O’Shead (@hgaldinoshea). 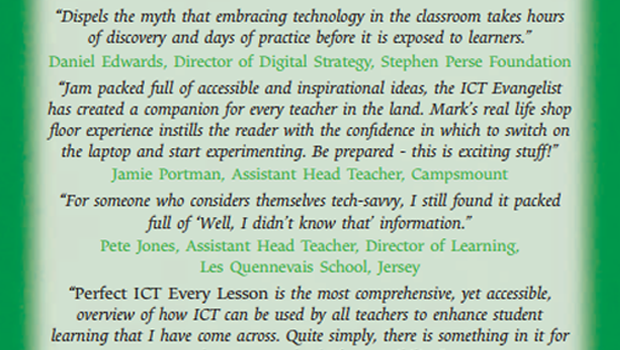 I always wanted the book to not be about an ICT lesson though. For me, apart from the discrete subject, more importantly I think, ICT has been about how it can bring about transformational improvements and changes to learning across the curriculum. Certainly, the meteoric rise of mobile devices in schools has brought about a massive shift in this direction (covered in Chapter 5). 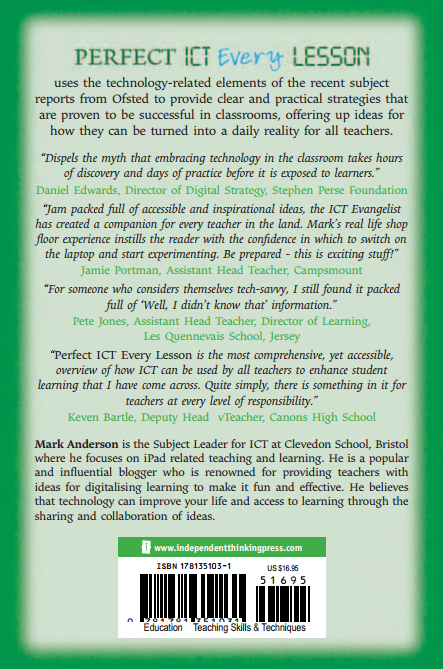 This is why the book has the title related to ‘ICT Every Lesson’ so that it is clear that it is about using technology in every lesson. That said, many of the ideas (I hope) will be of use in ICT lessons too! Last weekend saw the book launch in Brighton at the Labour Teacher’s TeachMeet. There was a real plethora of Twitterati there and it was definitely a different kind of TeachMeet. With the TeachMeets at Clevedon I’m used to having a number of ‘Twitterati’ there, but it was the political edge that made it different. Whilst it had the hallmarks of a TeachMeet, the fact that Stephen Twigg was there made the presentations that much different, as alluded to in Joe Kirby’s post here. The evening moved on to the book launch which took place on site, in the garden, in a yurt. That’s right…. in a yurt. A world first? @ICTEvangelist Finished the book. Great stuff – congratulations! I’m very pleased so far! If you’d like to get a copy and find out more, then you can get a hardback copy or a kindle copy direct from Amazon although you can pick it up in Waterstones, W H Smith and other good book shops (there’s a phrase I never thought I’d say!). Massive thanks must go to Jackie Beere, Caroline Lenton and all of her team at Crown House Publishing without whom this book wouldn’t have been possible. Thank you too to Ty Goddard and Ian Fordham of the Education Foundation for organising and supporting the launch. Thank you too to all of the outstanding teachers out there who inspire me every day and supplied the many case studies in the book. Thank you. Any thoughts on giving a free kindle edition with a hard copy? Would be nice to have access to it at school on the fly.